How is our Cushion Construction Better? Watermark Living™ is proud to make all of the cushions for our furniture in our own facility here in sunny Florida, USA! We are proudly recognized for manufacturing some of the best quality and most comfortable cushions in the industry! Having our own cushion manufacturing capability allows us to provide you with the best quality cushions for your furniture whether they are used indoor or outdoor. 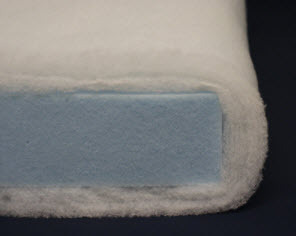 All of our foam is high quality, American made virgin polyurethane foam. Density and thickness vary according to its seating application. Sofas and loveseats are thicker and less dense while dining and other thinner cushions are more dense. Our foam may be used indoors and outdoors. When used outside, our specially constructed cushions dry quickly. For even faster drying of any cushion, stand it on it's side in the sun! Foam density is not weight; it is actually a measure of volume. Density is a function of the chemistry used to produce the foam, of additives used to increase density and of any additives used to improve the combustion resistance properties of the foam. Flexible polyurethane foam is measured in pounds per cubic foot (pcf). It is available in a broad range of densities, ranging from as low as 0.8 pcf to as high as 6 pcf. Most foam applications utilize foam in the 0.9 to 2.5 pcf density range. Foam density is a function of the density of the virgin, or unfilled foam. This is also called polymer density. If the foam contains no additives or fillers, the polymer density is the same as the overall foam density. When additives or fillers are used in producing the foam, the foam density will be higher than the polymer density. Generally speaking, the higher the polymer density of the foam, the greater the cost of the foam. However, this foam will generally also have better physical properties including support and durability. Don't worry... you don't need to understand all of this. You can trust that Watermark Living™ has developed the perfect formula to balance all of these factors into the most comfortable and durable cushion in the industry. *** Important: To save money, some manufacturers, including imports, make cushions that appear to be all Dacron. This is not Dacron. It is what is called densified polyester batting. This type of cushion, though comfortable at the point of sale, will break down and flatten out quickly. There is no substitute for high quality polyurethane foam. Almost all of our cushion backs are blown fiber. This blown fiber may look like Dacron but it is not. Blown fiber is picked and lofted by a large baling machine and blown into bags to be used for back cushions and pillows. This type of cushioning offers the most comfortable back support for various shapes and sizes of people and also adapts perfectly to a multitude of cushion styles. Most buttons use steel cores. All of our buttons have aluminum cores with nylon backs. This makes our buttons weather resistant and rust proof. Our buttons are covered with matching fabric and are machine pressed together and thus require very little care. In the very rare case that a button becomes loose or falls off, our customer service department offers complimentary button replacement tools to assist customers with their replacement. All cushions require some kind of care. Even our cushions need to be fluffed from time to time. They need to be turned over and sometimes the seats need to be adjusted to keep the seams looking good. Cushions are not designed to be taken apart by the customer and should not be machine washed or dried. Doing so could cause the seams to come apart, possible shrinkage, and will void the warranty. Cleaning of your cushions should be in accordance with the cleaning code of the fabric. If your cushions must be washed we recommend using a dry cleaning machine. Remember you do not have to take apart your cushions to clean them. We do offer replacement cushions for sale as well as foam and casings, should you have an accident or would like to freshen up your furniture with a new fabric. View FABRICS. Need replacement cushions or want to change out your cushion casings for a fresh new look in your decor? Let us make them for you. Our PERFECT FIT program is a great way to liven up any space outdoor or indoor with a fabric change. You can check out the many types of PFIT cushions we can produce. Just measure your pieces and we will do the rest. Contact us or click on the link below for more information.